Advanced Pasta and Rice Baby Food Meals & Baby’s Food Recipes the Whole Family Will Enjoy. Baby Food Vegetarian Recipes, Pasta and Baby Rice recipes – OH MY. Just the potential for exciting baby with the fun shapes of pasta are intriguing. Try some new baby food meals and serve some yummy pasta, rice and more adventurous food combinations for “baby food”. We do keep stating it but it’s true – Baby Food doesn’t always have to be fruit purées or purées of veggies and meats. We are posting Yummy Recipes that may be used for Baby “Meals”. These “baby” recipes are recipes that the whole family may enjoy and eat. These pasta, rice and more baby meal recipes should all be suitable for those non-allergic babies who are 10 months of age and over. Please note however that some ingredients may not be suitable for a baby under 12 months of age. Items with a ** beside the recipe ingredient indicates the ingredient may need substituting. Step 1: Prepare fish filets: brush lightly with olive oil and season with salt and pepper. Broil, pan sauté or grill. Set aside (along with cooked rice). Step 2: In the meantime, prepare mango avocado salsa: in a medium bowl, toss mango, avocado, onion, cilantro, lime juice and a very small drizzle of olive oil. Season with salt and pepper; taste. If the mango isn’t perfectly sweet, you may want to mix in a drizzle of honey. You don’t want the salsa to have an overall sweet flavor, but you want a nice balance between sweet, salty and tangy (from the lime). Combine well and, if you have the time, allow the salsa to sit for 20 minutes to allow the flavors to marry. Step 3: Plate the fish over a bed of rice and top with salsa. Flake the fish for small kids. 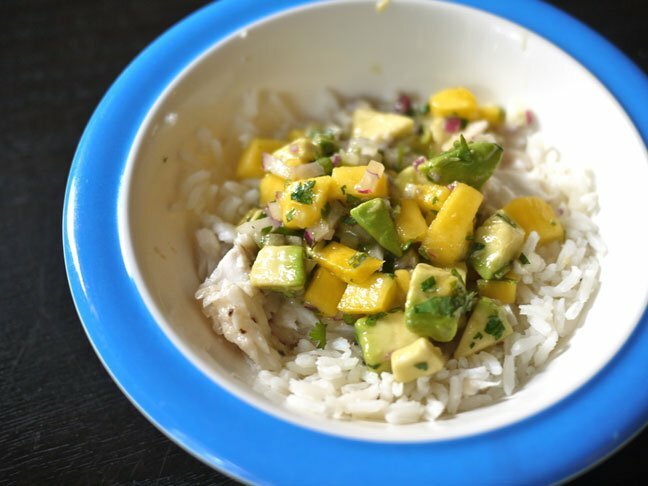 Pulse the whole combination (rice, fish, mango and all) to an age appropriate consistency for infant eaters. Then everyone enjoy! Hodgson Mills Buckwheat Pancake Mix (http://www.hodgsonmill.com/) WE LOVE Hodgson Mills grain and mixes.. Step 2: Fry gently in olive oil until done. Freezes and warms well. SERVE WITH: Morning Yogurt Soup or a hearty chowder. Step 1: Mix sweet potatoes in a mixing bowl with egg. Stir in the flour and add the baking powder. Step 2: Add up to 1/3 cup of milk, stirring. Step 4: Place a non-stick or heavy iron skillet over medium heat on top of the stove and add 1/2 tsp butter. Step 5:Spoon batter into the skillet and cook until bubbles rise to the surface of the pancakes and break. Approx. 1 to 2 minutes. Flip the pancakes and cook another 2 minutes. Step 6: Remove pancakes from the skillet and keep warm on a covered plate in the oven. Freezes Well. Step 1: Sautee Onions then combine squash, onion and spices.. cook on low for 10 minutes.. Step 2: Stir in broth and cook another 15 minutes.You may also add 1/2 cup of applesauce for extra yum. Step 3: Cool Slightly and pour 1/3 into blender and blend until smooth, repeating until all of the mixture is blended . Reheat soup before serving, add cooked rice and swirl in some ‘sour cream’.. yummy. SERVE WITH: Spoon soup into hollowed out round Boule bread bowls. Watch your older baby dig in. Step 2: Chop & steam or boil the sweet potato until tender, drain well. Mash until almost smooth. Step 3: Cut the zucchini into small dices – add zucchini and all other ingredients to mashed sweet potato and mix well, season with salt & pepper if desired. Step 4: Divide the mixture into equal portions and cook in lightly oiled frying pan for approx. 3 minutes each side, Drain on paper towel. Step 1: Peel and grate the potatoes. Place margarine or butter in frying pan and let melt. Step 2: Add grated potatoes. Cook for 8 to 10 minutes. Step 3: In a small mixing bowl, mix the eggs and milk together. Step 4: Once potatoes are cooked, add ham and eggs. Step 4: In a medium skillet, heat oil on medium heat. Sauté apples, onion, mushrooms, celery for 2-3 minutes. Sprinkle thyme, oregano and sage. Stir in cooked rice, apricots and raisins. Add apple cider, cook until apple cider is almost evaporated. Step 5: Place cooled squash on a large nonstick cookie sheet. Spoon stuffing into squash cavities. Bake for additional 20 minutes.